Wine buffs often argue over which is better, cork or screw top. Now a new bottle top combines the two. It's long been a point of debate among wine buffs and even the most casual of drinkers: which produces the better bottle of wine, the cork or the screw top? 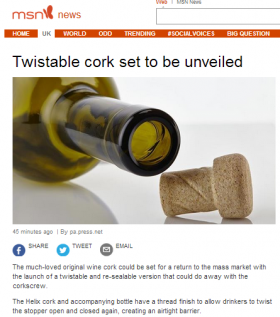 Well, the much-loved original cork could be set for a return to the mass market in the form of a twistable and re-sealable version that could do away with the corkscrew. The design is the result of a four-year collaboration between Portuguese cork manufacturer Amorim and US bottle maker O-I, who are aiming it at the £5 to £10 “popular premium” market. Winemakers have increasingly been using alternative stoppers in the form of metal screw caps or plastic to combat complaints about the inconsistent quality of cork and the resulting “cork taint” – the sour, musty taste that ruins a wine. And consumer research in France, the UK, the US and China has been met with “overwhelming acceptance”. Bouts said: “For centuries, cork and glass has been a winning combination in the wine market, yet it is only through this partnership that we have been able to create such a major innovation in the industry. “Cork is still by far the preferred stopper. Our research has found that at least 80% of consumers prefer the cork and glass combination for their wine. Andy Baillie, manager of Spirited Wines in Cardiff, said: “The cork never really went away. To be honest, people always prefer a cork in a bottle to a screw top even though the screw top technology now has improved so much that there’s no reason why you shouldn’t have good quality wine under it. “However, whether it be natural or synthetic the majority of customers do tend to prefer a cork just because it’s the more traditional thing. “Some people express a preference, particularly if it’s going to be a gift. But for their own consumption I haven’t noticed any particular aversion to screw cap. “Though people do have the impression that the screw cap wine will be of inferior quality even though it’s generally not. Mr Baillie said the cork originates from the Iberian peninsula but the screw top comes from the new world of wines. “When the new world, particularly Australia and New Zealand, wine industry started taking off in the 1970s the demand for corks was such that the Portuguese would ship off the more inferior corks to the new world and keep the good ones for themselves," he said. “So the Aussies and New Zealanders got sick of having this stuff, and of having the cork taint the wine, so they essentially switched to screw cap because they couldn’t get the decent stuff. “Now the cork cleaning technology has improved so immensely that the number of spoilt bottles has reduced dramatically over the last few years. Neil Cammies, who writes the Straight Off The Vine column for the Western Mail, said: “It will be interesting to see how it will be received in the marketplace. “I’ve got no snottiness about screw closure at all and I think that is thing of the past, especially in the UK, where we have such a broad outlook to wine. “We like our posh nosh but we also like our regular glugging wine. And we’ve now embraced all sorts of technology anyway, from wine boxes to screw closures to plastic corks. “They’ve obviously thought ‘let’s bridge the gap between cork and screw closure and amalgamate the two’ which is a great idea. Simple ideas are usually the best. “It will be interesting to see who uses it as the old world are very reticent about moving to new technologies but they do eventually. “That said, they’re aiming it at the screw closure market not the premium market and some people still love using a corkscrew because of the ceremony of it.